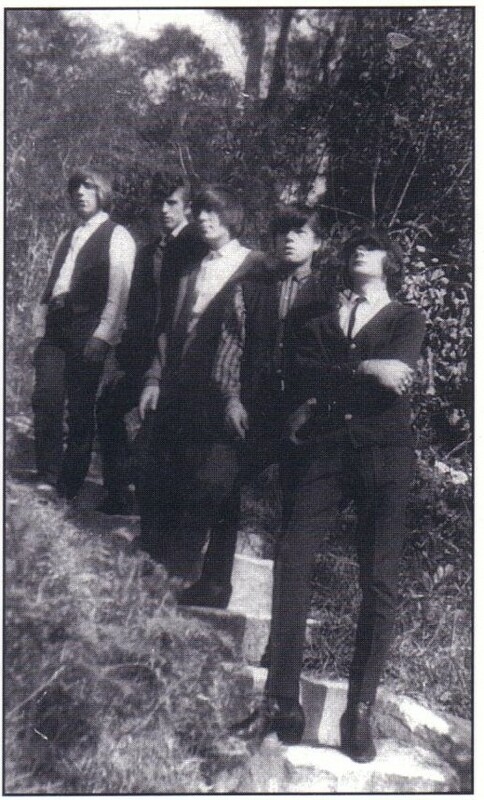 The Creatures as they appeared to Everybody’s Magazine’s photographer in 1966. From left to right they are; Eric Marcic, Richard White, Keith Matcham, Rudolph Marcic & Herman Marcic. 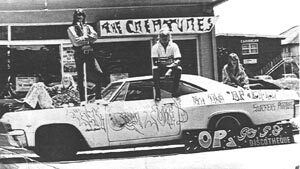 The Creatures are claimed to be one the most infamous or famous bands to play up and down the eastern coast of Australia from the mid to late ‘60s. They even ran their own discotheque on the Gold Coast. How did this happen? Where did they get their reputation from? What became of them? I hope to answer these questions and some more! We need to go back to the beginning. Okay!! The Marcic brothers lived in Mildura, a regional town in country Victoria. They had a friend whose father owned a short wave radio, from this they listened to the latest music from England. They had a head start on everyone else as most of this latest music was not released in Australia for at least another two or three months. The brothers recorded the top 40 onto a small reel-to-reel tape recorder every night. Thus the brothers would listen to and learn the songs on their instruments. At this time they formed a band called the Beagle Boys. The members were Keith Matcham (v), Eric Marcic (l), Rudolph Marcic (d), Herman Marcic (b) & Michael Parnis (r). This was sometime in 1965, the group played r’n’b covers like The Rolling Stones, THEM, etc because they saw them as being rebellious to society. On the odd occasion Rudolph would play the accordion to such songs like Red River Rock. In Mildura at the time the music was far from being conservative, there were local bands like The Rhythm Rockets playing Shadows’ covers, they eventually started playing the top 40 hits. The band’s fortunate changed around Christmas 1965 because during one of the local dances the Beagle Boys supported The Easybeats and the promoter Tom Towle suggested if they changed their image he would get them work in Sydney. The band couldn’t do the pop thing so decided to get out. At this time the groups set list compromised songs like Oh Carol, Not Fade Away, Satisfaction, The Last Time of the Stones, Baby Please Don’t Go by THEM, another artist covered was Chuck Berry so with this in mind The Beagle Boys duly changed their name to The Creatures, the date was the sixth of February, 1966, just eight days before Australia changed to decimal currency. As promised Tom Towle got the band work in Sydney, the group played support to The Easybeats at The Beatle Village. They also toured around the country areas and even into Queensland. Michael Parnis decided to leave at this time as his had a secure job and didn’t wish to leave Mildura, his place was taken by Richard White. As usually was the case three or four gigs a night was not uncommon, they drove around in an old Buick with the bands moniker painted on the side of the vehicle. “There was one time in Bathurst — this was a scary one — our car broke down, it was an old Buick. We went out to Bathurst to play in the town hall there, there was about five or six Sydney bands — The Midniters and guys like that…But there was a little band called The Verdettes whose singer was actually a Pom — and I suppose to the girls he was really cute, he had long hair and a pommy accent. And this particular person’s girlfriend took a liking to him, and of course he didn’t like it, and so he started beating up on him. And (the band) came running over to my brother Rudolph and said, ‘Ohhh they’re beating up poor so-and-so’, so we all went in and stood our ground, and of course a couple of hits and the guy went down. And Rudolph said, ‘Righto, let’s get back!’ Everything was done. “Oh yeah. Especially Darlinghurst, where you had the Maltese contingent to deal with as well. Their secret was to send a small bloke out and he’d sort of pick on someone, and then when you retaliated, he’d give a whistle and about a hundred of ‘em would come around the corner. The band received good live reaction because they felt that they weren’t progressing enough and thought maybe a gimmick was necessary. A French hairdresser whom regularly did Keith Matcham’s girlfriend’s hair remarked halfheartedly that he would like to get a hold of someone and dye their hair with lurid colours, naturally this comment didn’t go unnoticed so Keith heard about it and this was the gimmick the band was after! One by one the boys had their hair dyed in different colours, Eric became a redhead, Herman decided upon blue, Keith purple, Michael pink & lastly Ruldoph with green. Later on the group showed up on the television show ‘I’ve Got A Secret?’, we can only guess what their secret was? I wonder how it all went? 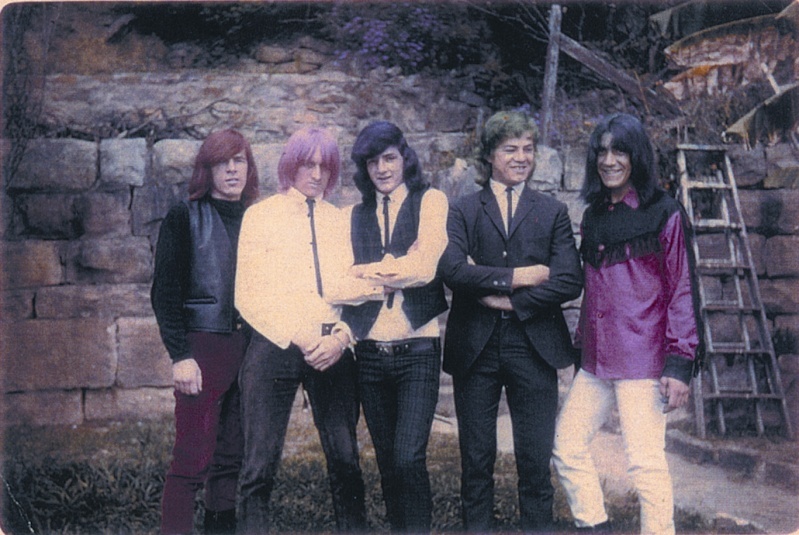 The band was picked on by people on the street about the way their hair looked, not only was it long but coloured too, this just didn’t happen in 1966 society. Someone mentioned that they were from outer space! The price you pay for being different and gimmickry. Late in 1966, a friend and part time roadie mentioned to the band he knew David Gibson was building his own recording studio in Hurtsville. The band met him and helped him finish it. This was the group’s first attempt at building a recording studio and were amazed at how good the soundproofing was. When the two doors to the studio were closed sometimes a semi would drive past on the road and the only way anyone would know it was passing by was when the floor started rumbling, there were no noisy disturbances at all. David Gibson offered to record the group, out of this long session came the famous 66 Sound recordings of Mona/All I Do Is Cry plus other tracks. 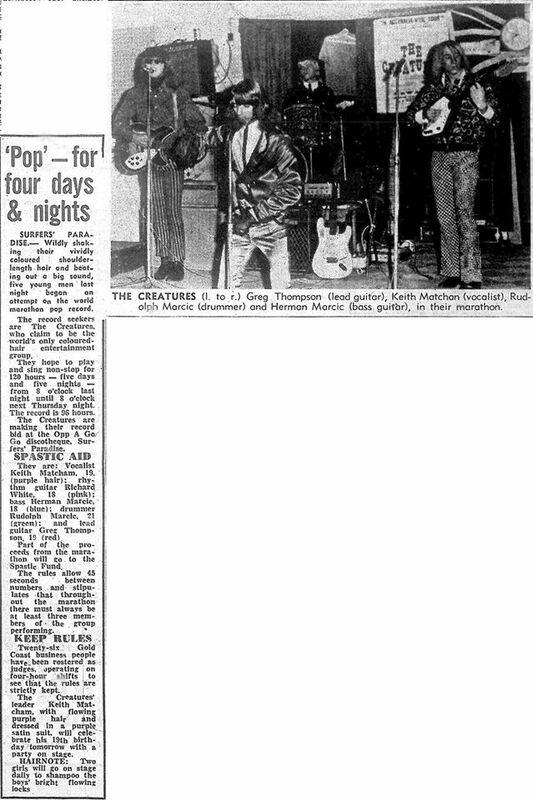 The Creatures recorded Mona like the Rolling Stone’s version of the Bo Diddley classic, apparently another Victorian group Geelong’s The Tikki’s recorded a version of Mona on the Segue label which is so similar to the Creatures version that it has been rumoured that when the bands cross paths in 1966 they may have inadvertently heard it from each other. Anyway on the other side of the vinyl, All I Do Is Cry is a group original which is quite raw and feels under produced, this makes it even better than having the song produced as a polished version up in a higher profile studio. So this is certainly excellent news that there are as yet unreleased Creatures tracks. Anyway I digressed too much. David Gibson’s intention was to change the Sound label every year so it would read 67, 68, 69, etc to keep it updated. Herman Marcic mentioned that some Buddy Holly covers were recorded along with a song called Brown-Eyed Handsome Man. David did record other stuff from his Top Spot studios, one that comes to mind is The Cyclones’ Tossin’ and Turnin’. Other recordings were usually leased out to other label for distribution. Top Spot studios became the famous Copperfield Studios of the 70s. The single went nowhere sales wise, and there only four or five in existence now. Not even the band members themselves own a copy of it. By 1967 the band was now managed by a well known television announcer Max Rowley. They played in Queensland for some months eventually getting to Surfer’s Paradise. To spot the growing number of graffiti on the clubs walls the band came up with a brainstorming idea of painting the walls with blackboard paint and leaving coloured chalk nearby while they played, they really good drawings would stay for around two weeks while the rest was wiped clean each morning, so graffiti on the walls wasn’t a problem after that. With the club being unlicensed coke was the drink of choice, no drugs were being used as a physician was always around. Not long after they started running the club Eric decided to leave. Eric was an apprentice electrician away from the band and decided to return to Sydney and marry his girlfriend. A new lead guitarist was needed to be found and that someone was Greg Lawrie, whose very short hair put him out with the band’s gimmick of coloured dyed hair. So in order to keep things going and that their fans were unaware of it, Greg was made to wear a red wig. During a break between sets Greg went off to chat up a bird, when the time came for the band to recommence he refused to come back up, after many attempts to persuade him so they took it upon themselves to carry him up onto the stage where to everyone’s surprise his wig fell off and at once he put the silly thing on backwards. The new lead guitarist was really a “non-guitarist who could only play a few chords but with time became a very accomplished player. I often wonder where he got his nickname of ‘Sleepy’ from? The band played each and every night. At one stage their a guy from the Guinness Book of Records was suppose to such up, however he turned up on the wrong day. The Creatures played for four days and four nights non-stop, the fingers of the band members were red raw and nearly bleeding! The vehicle of choice at this time was a gold coloured Ford Fairlane 500 with vinyl black roof with The Creatures written on the side this belonged to Keith Matcham who was extravagant by nature, boy talk about free publicity! Like all things the running of the club came to a natural end and they all decided to go back to Sydney, at this time the coloured hair was out and in came the bleached look and as usual Keith decided to dye his black in keeping with an image. As far as the viciousness of the sixties went, we were actually changing a motor in the main street, we thought we could get it done by daybreak. We had a Dodge car and a Dodge truck, and we were gonna put the motor of the car into the truck. And the only thing we could use to lift it out with, was a streetlight pole. So we got a couple of ropes and tied ‘em together, pulled it up and threw it over the light pole. We started dragging the motor out and it took a bit longer than we thought… the clutch-plate wouldn’t fit. Eventually the band moved to Melbourne because the Marcic’s mother was in intensive care due to a bad car accident. The band started to do very well playing at venues like the Garrison, the Thumpin’ Tum & the Catcher supporting people like Billy Thorpe. The band started to venture into deeper blues music like the Cream. No sooner did they get to Melbourne before RCA signed them to a contract. The band were asked to record a single which they only too happy to do the only problem was they needed to be in Sydney the next day to do it. So they hopped into the car to make long trek north. The car broke along the way but luckily Keith Matcham’s father pulled up in a brand new HD Holden. All of them piled into the car and drove up to record Ugly Thing and Your One And Only Man. The recording was only one hour long and then they had to drive back to Melbourne straight away. Thankfully they did record the 45 because it is best singles every to be recorded in this country. Ugly Thing is a snotty vocalled tight arrangement with excellent organ breaks augmented throughout the three plus minute bluesy original with fuzz. The flipside Your One And Only Man is a blue-eyed soul number that singer Keith Matcham enjoyed doin’ so much. This too is an original. The record didn’t do well as with the Mona single it bombed too, but on the bright side of things they still garner plenty of live work. This was late ’67. In 1968 the management arrangements changed with CamPact’s manager David Flint taking over and a new recording deal was established with Festival records. Later in 1969 at the insistence of Ian ‘Molly’ Meldrum the band changed their name to The Chocolate. The band recorded one final record on the Festival label at the west side of Chapel Street, Saint Kilda. During the recording of I’m An Animal, the Ford Fairlane belonging to Keith Matcham was damaged by a hit and run truck. Hopefully in a future issue of this fanzine I’ll be able to give you an update on the David Gibson unreleased Creatures tracks. Acknowledgements: The Herman Marcic quotes are from an interview done by Iain McIntyre. Recommendations: All I Do Is Cry can be found on the “It’s A Kave-In” compilation (Kustom65 K6500001 1998). Ugly Thing can be found on the “Ugly Things – The CD” compilation (Raven RVCD-26 CD 1992); “Ugly Things #1 compilation (Raven RV LP-02 Vinyl 1980); “25 Rare Recycled RCA Rock Relics” compilation (RCA VPL1-0240 Vinyl 1979). All I Do Is Cry/Mona/Ugly Thing/Your One And Only Man can be found on “The Creatures” EP (Top Shelf Records 1999 Vinyl).